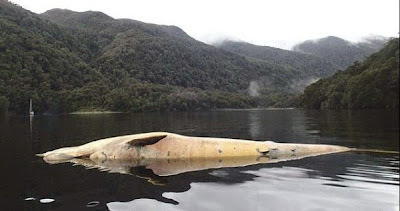 2015-April-21: More than 20 large sei whales were discovered dead and rotting inside an inlet along the rocky coast of southern Chile. Officials did not know what killed them or when. Researchers ruled out human involvement (link). In June, 337 dead whales were discovered south of where the sei whales were found. The was a 5.1 magnitude shallow-focused earthquake that occurred on 13 March 2015 not far from where the whales were found USGS report. On 24 March 2015, there was a more dangerous, vertical thrusting 5.2 magnitude quake ~1,000 km offshore that might have also been responsible (link). Surface currents from this offshore quakes would have guided injured whales into the area where the carcasses were found. To make matters even more confusing, the fisherman in the area might be using dynamite to kill whales that they believe are eating their fish. But blast injuries from explosives are much different that barotrauma from low-frequency seismic sea waves. This quake was especially dangerous because the water is very shallow in these backwater canals. For example, if the depth had been 3000 meters and the whales on the surface, the seismic pressure waves would have spread out and weakened before reaching the surface. By the time the shocks reached the whales, they would likely have weakened to point where any injuries would be minor. On the other hand, in water only 10 meters deep, the whales would get hit with a much stronger shocks. Another determining factor is the distance between the hypocenter (focus) and the rock-water interface. The quake's depth of focus below the water's surface is always defaulted to 10 km. On the other hand, the depth of focus might have been only 5 km below the surface. We have no way to know for sure. If the focal point was indeed only 5 km deep, weakening due to spreading would have been reduced by ~50%. In other words, the danger from a quake 5 km deep is twice what it is from a quake hypo-centered at the default value of 10 km. Nor do we know the direction of the motion along the fault at the focal point. If this had been a vertical thrusting event, rather than a horizontal thrusting event, the shocks traveling to the surface would have been maybe 5 times more dangerous to the whales. This is so because water will not transfer shearing (side to side) motion. This is similar to rowing your boat with the oars turned sideways. My suspicious is that this was indeed a vertical thrusting quake since it occurred in a subduction zone known for such motion. Furthermore, there is a unique anomalous transparency that will occur when the distance between the focal point and the rock-water interface is less that the length of the p-waves generated during a particular event. Depending on the type of rocks between the focus and the rock-water interface, the length of the p-wave would have been ~7 km. If the depth of the focus was greater than 7 km, a portion of the seismic energy would have reflected back into the solid earth while another portion would have moved into the water. On the other hand, if the depth of focus was only 5 km below the rock-water interface, the full force of the p-wave would have passed through the rock-water interface as if there were no interface at all. You can read more about this anomalous transparency between water and air at this link. The author, NOAA physicists Dr. Godin, assured me that this transparency was the same for the rock-water interface as it was for the air-water interface. The great number of quakes you see in the chart below occurred over many years. The recent quake, marked with a large red star, was the event that killed the sei whales. Earthquakes rarely occurred in this area so this quake must have come as a total surprise to these animals, who likely considered this area as an earthquake safe zone. By the way, I should mention here that all whalebone calving areas around the world are free of whale-dangerous earthquakes. It appears that the whales have been aware of the seismic danger they face for many millions of years. The decaying mammals were grouped together and laid out along a grass-and-rock shoreline. None of them showed signs of external injury, which would be consistent with internal barotrauma induced by shock waves from the nearby seabed upheaval. The whales apparently survived for several weeks before they died. They were discovered, some beached and some floating in a tight group, about 250 km north of the Gulf of Penas. They measured about 10 meters (33 feet) long. The cold water area in southern Chile in which the whales were found in a partially closed by rugged fjords surrounded by green forests. 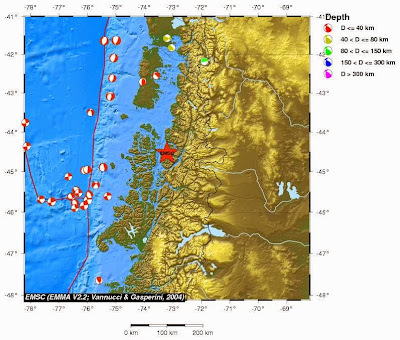 The exact location of the epicenter can vary as much as 10 km is all direction, depending on the seismic agency reporting the event. The cold would have slowed the decomposition somewhat. A small Chile navy base is located several km north of where the whales were discovered. The whales likely moved into this secluded, protective area to escape rough offshore seas that are common here in March. These is not the first time a group of whalebone whales killed outright by an undersea earthquake. It happens quite frequently but whale scientists can't seem to sort out why. Or should I say they don't want to sort it out because the injury involves sinus barotrauma, the same injury caused by explosives, navy sonar, and oil industry airguns. The US Navy and NOAA want to keep you in the dark about how barotrauma kills marine mammals. The reason involves the "best available scientific information" clauses in the Marine Mammal Protection Act of 1972. These 18 clauses say that the federal government must protect our whales to the best available scientific information which sounds really nice until you realize that the Navy and the oil industry control 97% of all the money spent worldwide on whale research. Since they control the cash, they control the topics researched. And, since all their whale-killing instruments induce sinus barotrauma in diving marine mammals, they will not furnish one thin dime to develop any best scientific information on sinus barotrauma. This was the sole purpose of putting the best scientific information clauses into to whale protection laws in the first place. The whale-loving public has been deceived for many decades by the US Navy, NOAA, the oil industry, and the unscrupulous whale scientists that get paid to keep quiet about the deception. It reminds me of the days when the tobacco industry were paying doctors to endorse cigarettes.